I had the privilege of being a guest at the Anglican Centre in Rome in 2011. This centre was opened through the vision and leadership of Archbishop Michael Ramsey. The Anglican Centre in Rome was founded in 1966 and is located in the historic center of Rome, only a few minutes from the Vatican. It is a registered United Kingdom charity, but its work is for Anglicans across the world. Its director acts as the Archbishop of Canterbury’s Representative to the Holy See, but he is available to the whole Anglican Communion. The Centre includes a library, a reading/seminar room, and a chapel dedicated to St. Augustine of Canterbury. 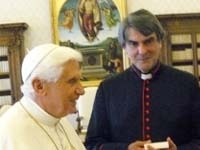 My visit included a lovely time with the director, Canon David Richardson (seen in photo to the right of Pope Benedict XVI). David has recently announced his retirement, effective April, 2013. Our small team celebrated a liturgical reading and hymn prayer service together with Canon David. The Anglican Centre was established just after the conclusion of Vatican II to be a permanent place of dialogue and relationship between the global Anglican Communion and the Catholic Church. It remains committed to this purpose today thus during the recent Synod of Bishops on the New Evangelization the Centre included a visit from Archbishop Rowan Williams. Archbishop Williams spoke to the Catholic Synod as one of many Protestant guests. As I said above this last quotation underscores a deep passion of my own. By networking with the Focolare, in particular, I have seen how communities who share in a contemplative practice can model evangelism and compassion in a Christocentric way that honors ecumenism and seeks to share the love of God out of community life lived in the Spirit. I look forward to sharing more in the fellowship of Focolare in the days ahead and I will share more of this journey with you as I do. I received today an invitation to speak for a January 2013 Focolare gathering for prayer. I was pleased to accept this kind offer to preach. If you had asked me five years ago if I imagined myself sharing in this kind of life and friendship I would have looked at you with utter incredulity. I didn’t even know such communities existed, much less that I would be sharing life with them in Christ. If I have learned anything in the last decade of my life it is this–remain open to the leading of the Spirit of God, put your roots down deep into the active love of Christ, build contemplative prayer and practice into your routines and move forward. God will guide you and use you.